Happy New Year to everyone! There are barely three hours left to 2009, and all things considered, it’s been a rollicking year…especially in the kitchen! During the holidays, I baked a lot of bread and made desserts – like someone who thinks the world’s supply of sugar will disappear in a few days. We also received fat-laden goodies that I had to shove into the freezer. People brought cookies, cakes, and all kinds of food wrapped in puff pastry so by the time I got to the last day of December – this morning – I was craving for a green, on-the-cheap kind of meal. Glad I went to the Asian store yesterday to stock up on Oriental greens. For lunch on New Year’s Day, it’s going to be strictly vegetarian so I’m making Vietnamese fresh spring rolls, and will also try to make Vietnamese Goi salad. In my most recent post, I had talked about recipe-sharing and a reader kindly offered to point me to his web site where he explains how to make Vietnamese Goi. If I’m successful with it, you’ll be the first to see pictures of it on my next blog. So that the gooey fluid is minimized, the crowns are not chopped off while they’re cooking. When you serve them, that’s when the eater takes them out with a knife. I don’t think the rough texture of okra should bother you. Once cooked, it doesn’t scratch your tongue. That’s a promise and it’s absolutely digestible! 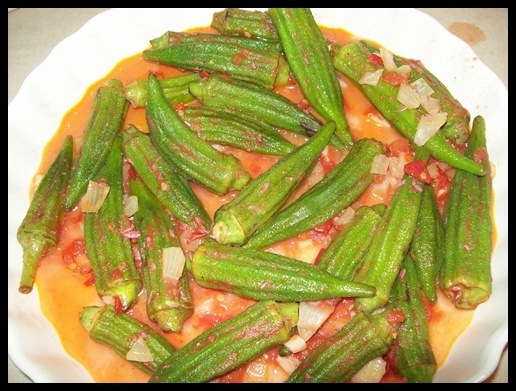 If you like gumbo, you’ll be won over by okra, a vegetable that was introduced to the United States from Africa. It’s low in fat and cholesterol. Nutritionists say it’s packed with vitamins and minerals – 100 grams equal only 33 calories. The only time to avoid okra is when you’re trying to gain weight. It can be cooked on the stove top, baked or steamed. It becomes tender after about 10 minutes on medium heat. 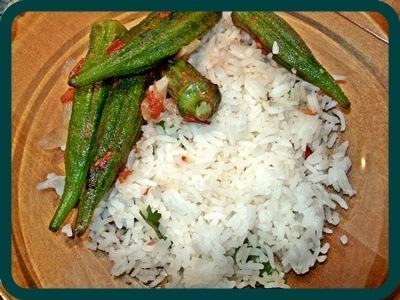 I eat okra with rice. It sure hit the spot today. It was a refreshing meal compared to the very rich foods I’ve been enjoying because of the holidays. Nothing like a simple and homemade concoction after all the fancy holiday foods! Sharing recipes is a very natural and human gesture not only among friends and family but also among virtual strangers. Just type your ingredient or desired dish on google and presto, you get pages and pages of results. That’s what I like about the Internet. It lives and breathes democracy in the sense that everyone, regardless of their station in life, has free and unlimited access to any kind of information they need to make their lives easier. 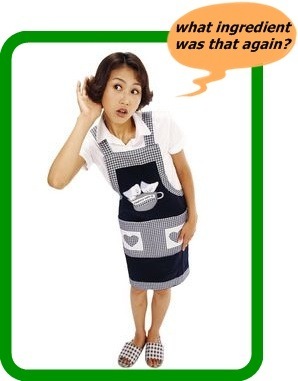 Question for you: what do you think of people who refuse to share their recipes? My brother and I were invited to Christmas dinner on the 25th. I had made some chicken with rosemary, molasses bread, and a chocolate cake as my "contribution". My friend did not ask me to bring anything but I never want to go to a party empty-handed (in our culture, pot luck dinners are not common; it would be unthinkable to invite friends and then ask them to bring a dish). My friend prepared food like she was feeding an army; there were only about five guests and counting the friends of their kids, we were about 10 people. But it was a dinner table laden with abundance. My friend suggested we start with a Vietnamese soup. Divine! It sure hit the spot. Then my friend suggested we try the salad because she was sure we would go gaga over it. We did. I went back for a second and third serving of the Vietnamese salad because it was refreshing and light. I detected a hint of lime juice, some mint and I think there were sesame seeds or chopped peanuts in it. It’s a salad I could eat everyday and I told myself I would add this salad to my collection. It’s even better than the celery root salad I fell in love with years before and which I continue to make. When my friend stopped puttering about in the kitchen and sat with us, I complimented her on the salad. She said, "no, I didn’t make it. My friend did. I wish I could make it myself." "So why don’t you ask her for the recipe and that way you can pass it on to me?" My friend shook her head vigorously. "I asked her a few times but she won’t share it with me. She said she’d be happy to make it for me but there was no way she was going to let me have the recipe." How selfish, I thought. But then I remembered that this was the same friend who owned a restaurant. For someone who makes a living cooking for others and serving exotic and delicious meals, I understand the top secrecy. Restaurant owners have a right to not divulge their recipe secrets – the same way that Coca-Cola never divulged the secret cola formula that made the soft drink a hit the world over. After my brother and I left the party, I was still savouring the taste of that wonderful Vietnamese salad. I was also wondering why non-restaurant owners do act like Scrooge when it comes to sharing recipes. There must be a sociological explanation for it. I’m sure the Internet would give me the answer. One writer said that people don’t share recipes because the recipe was probably handed to them from a family member who has since passed away. It could be that while that person was on her or his deathbed, the family was made to swear never to give the recipe to anyone. Another reason – the obvious one – is that people with commercial food interests have to protect their rights. The recipe that makes their restaurant or catering business so successful is a real asset. This one I understand perfectly. There are also those who share it only halfway just to make the asker shut up; meaning, they give out an incomplete list of ingredients. They leave out the one ingredient that makes a world of difference. Or they omit a step, modifying the cooking time or the technique. My take on the matter is if you’re going to share an "altered" recipe, don’t share it at all. It’s dishonest. It’s unkind. It’s uncharitable. Be honest and say you can’t share it. Like 98% of the human population, I like sharing recipes…and I go out of my way to share the essential tips that would make the dish more delicious. Most times, the success of a dish does not depend on the ingredients and procedures. The secret lies in the "tips." For instance, oyster sauce is a common ingredient in Asia. But there are certain brands that have a distinct flavor and when added to certain ingredients, bring out the best of the dish. When a recipe calls for oyster sauce for example, my tip would be to mix it first with a bit of water so that the taste isn’t too strong or concentrated. Much will depend on the kind of dish you’re making. I like to douse my vegetables with oyster sauce, but I wouldn’t pour it into the skillet directly. I’d put a small amount in a small bowl and add water, whisking it so they blend completely. These little steps do make a difference. Going back to this lady who doesn’t share her recipes, her restaurant closed down by the way. I won’t say that her refusal to share recipes caused the business to fold up, but it sort of confirms the sentiment that when you learn to share, what goes around comes around. And when you don’t share, that selfishness could have disastrous consequences. Bad karma perhaps? Eating is a real pleasure. Why not make others happy by sharing your recipes? From Calvin Trillin: "The most remarkable thing about my mother is that for thirty years she served the family nothing but leftovers. The original meal has never been found." This dish has a whopping 531 calories PER serving! No matter. I never had brie cheese mixed into a pasta salad so I was willing to turn a blind eye to the calories. Plus I didn’t want to have an argument going on in my head about being more weight conscious and going on the proverbial guilt trip. My goal at that moment was to eat well…and heartily! I seldom have brie cheese, and when I do, I eat it with crackers or a few slices of a baguette. I know that there are numerous recipes that have brie tossed into them. I clipped this recipe from the Montreal Gazette; unfortunately, I didn’t get the name of the author who shared it. Sorry, my bad. The recipe is simple to make. You get your daily requirements of protein, fat, carbs, fibre and sodium. The original one serves 12 people, but I halved the recipe. (I’m posting the one that serves 12 – just in case you’re scrambling to find a meal that will feed that many people). This dish might come in handy if you’re running out of ideas and there are barely any leftovers in the fridge! Perhaps there’s an unopened package of brie cheese somewhere – use it before the expiry date! 1. Combine the tomaties, brie, basil, garlic 1 cup of olive oil, salt and pepper in a large bowl. Cover and let rest for 2 hours. 2. Cook pasta according to package directions. You can add 1 tbsp of salt and 1 tbsp of olive oil. Cook the pasta al dente. Drain well. 3. 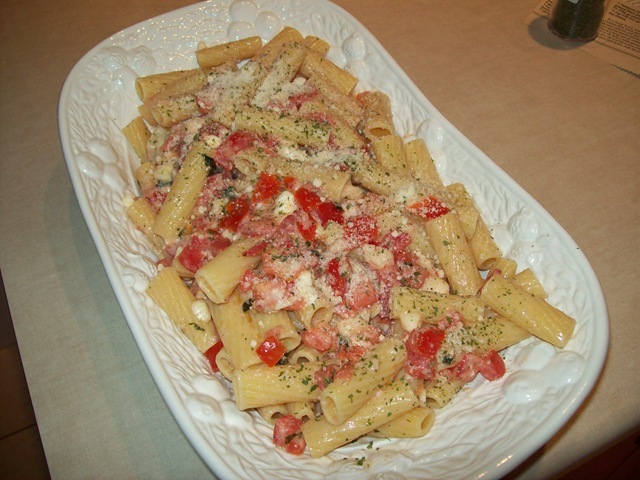 When completely drained, add the pasta into the tomato mixture and blend the ingredients thoroughly. Season with salt and pepper. 4. Before serving, sprinkle with Parmesan cheese. * I like Italian tomatoes – they’re juicier. * I forget what brand of brie cheese I bought (I don’t think it matters). Eat and be merry! For once, forget the calories. I equate the holidays with a tad of indulgence – and not necessarily with alcohol. It’s perfectly legit to spoil yourself with good, “hit-the-spot” food. The gym will open again on the 2nd of January. The holidays are not the time to scrimp and save, especially when it comes to eating. Christmas is a time to share and to let go off the purse strings no matter what. Putting plentiful food on the table mirrors our desire for prosperity in the New Year. Abundant food and drink chez nous is de rigueur as it is in many countries. Back home, grapes were a luxury (we can’t grow them because of our tropical climate), and my parents would shell out more money without an ounce of hesitation to buy good quality imported grapes; to us they symbolize good fortune for the coming year. We’d also have lots of noodles as they symbolize long life. Grapes and noodles plus a dozen other gourmet treats laid out beautifully was our way of celebrating the birth of Christ and welcoming the New Year – not to mention the deafening fire crackers that go off at midnight on the 31st, making you feel like the country is under siege. With all the good food eaten at midnight on the 24th and all day on Christmas Day, there’s that period after Christmas and before the New Year when we get that desire to give our digestive tract a break by eating more simple and less expensive meals. You know you’ve eaten too much rich food when you start yearning for a no-fuss, frugal meal. My budget meal # 5 is so easy to make…it won’t chisel off your already dwindling budget. 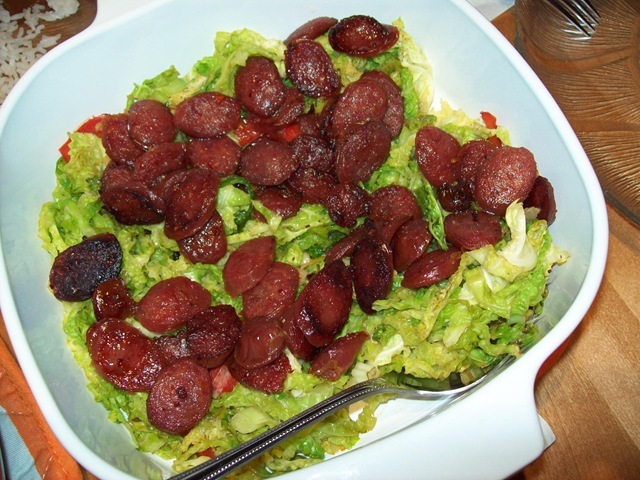 If you haven’t yet tried Chinese sausage, don’t wait until the Chinese New Year to do so. I combined the sausage with Quebec cabbage. You can use ordinary cabbage for this dish (and of course any kind of sausage). I don’t know if Quebec cabbage is available outside the province – I believe it’s home grown. The inner leaves are curly, have a dark green color and feel just a tad rubbery. I love it! They can be used to decorate salads too. This meal is good for 2 people. chop onions and garlic (about 2 tbsp each). Heat oil for 1-2 minutes. Sauté onions and garlic, and lower your heat to medium or low-medium (to avoid the garlic from getting too roasted). Throw in your strips of cabbage and continue sautéing until they’re crisp (don’t overcook them; you’ll end up with wilted strips). Season with salt and pepper. Set aside. Fry your sausage slices in a little oil – about 1-3 minutes (be careful not to burn them although they would still taste good)! Arrange your cabbage strips on a serving platter and sprinkle your sausages on top. Serve! Chinese sausage is available in most oriental stores and come in different varieties (some are made with duck liver). When you buy them, buy only the quantity you need because Chinese sausages have a distinct taste – I’ll go as far as saying they’re an acquired taste. Their taste ranges from very sweet to very spicy. Asian stores sell them in vacuum-packed plastic bags. The ones that are available in Canada are manufactured mostly in Vancouver and Toronto where there are large Chinese communities. Note, however, that Chinese sausages are not exclusively from China. 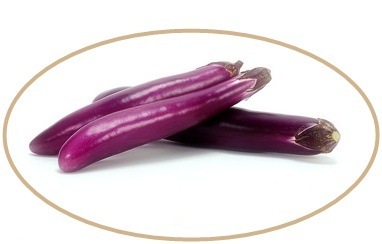 The generic name is used to describe any one of the varieties from Burma, Thailand, Vietnam, Taiwan or Singapore. To know what they look like, google “Chinese sausage” and you’ll see about four different images on the first page. 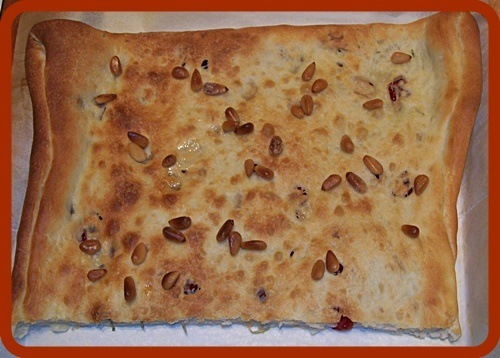 A cranberry focaccia recipe was featured in a SAQ insert in the Montreal Gazette weeks ago. SAQ stands for Société des alcools de Québec – Quebec’s liquor commission. When they promote new wines, they send out a leaflet called Tchin Tchin containing a dozen recipes that go well with these wines. You can view it here: (http://publications.saq.com/doc/TchinTchin/tchin_hiver_2009_fr/2009102801/. I wanted to try the recipe for three reasons: (a) it was fairly easy to follow (no prior kitchen acrobatics required), (b) it called for store-bought pizza dough and (c) it had only three toppings (read my lips: no-fuss recipe). The combination of cranberries and rosemary is nothing new. If you google “cranberry focaccia” there are as many recipes for it as there are for say, lasagna or spicy meatballs. Even Gordon Ramsay has a recipe! 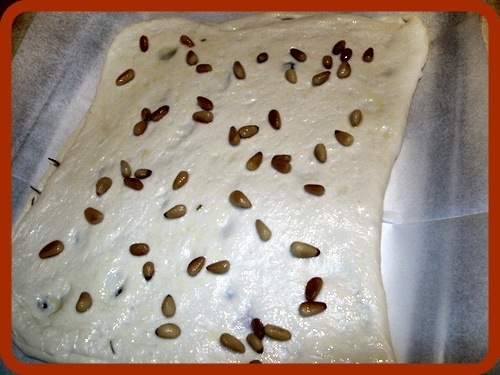 The third topping – pine nuts – sharpens the unique flavor of this focaccia. Taste-wise, I’d give this recipe an A+. It was my first time to try the cranberry/rosemary/pine nuts blend and I was won over. I’m not sure if I would classify it as a savoury bread because of the cranberries, but then I would be splitting hairs in this case. Savoury breads connote the use of herbs, so the rosemary would put this focaccia in that category. Here’s the recipe (you can also get it from the URL above). Read my comments afterwards because this recipe, though delicious and utterly savoury, can certainly be modified, in terms of the procedure. 1. Place the pizza dough on a plate, brush with the olive oil and cover with a damp cloth. Thaw overnight in the refrigerator or for six hours at room temperature. 2. Preheat oven to 425 degrees F (220 degrees C). 3. Roll the dough out into a 30 cm x 38 cm rectangle (12 in x 15 in). 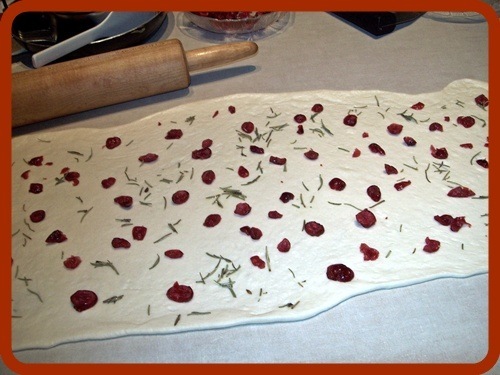 Sprinkle with the dried cranberries and rosemary and press them firmly into the dough. 4. Fold the dough in half and roll out again into the same-sized rectangle. 5. Transfer to a greased baking sheet. Brush the dough with oil and sprinkle with the pine nuts. 6. Leave to rise for 10 minutes or until nicely puffed. Add salt and bake on the lowest oven rack for 10 minutes or until golden. 1. I used dried rosemary because the store didn’t have fresh ones that day. I’ll use fresh rosemary the next time (yes, I will make it again). Peter Reinhart also recommends using fresh. As for the cranberries, I felt no need to chop them. 2. I had a hard time shaping the dough into a 12in x 15in rectangle, even after resting time. Maybe I should have weighed the dough. 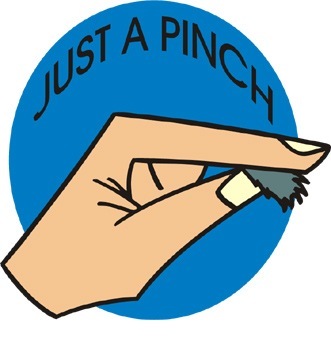 It may have been under a pound, which is why I could not stretch it out to that measurement. But this is not a major problem. 3. Instead of folding the dough over to sprinkle pine nuts, I would put the pine nuts together with the cranberry and rosemary. Spreading them atop the dough was precarious – some of them fell off. This can still be done if you poked your fingers into the dough and created pockets on which the pine nuts could sit. I remember reading Peter Rinehart’s recipe for focaccia and it called for this poking step and dousing the dough with herb oil (which can be made at home he says). He didn’t say anything about folding the dough in half. 4. The dough did not rise that well. I think it’s my fault – I over-kneaded. 5. The “bake for 10-minutes or until golden” instruction was more like 20 minutes. There’s nothing wrong with my oven – it’s only six years old. I had to put on the broiler on high for 2 minutes because the dough remained pale. Of course, my pine nuts burned as you can see in the last picture above. This is another reason why I would incorporate the pine nuts with the cranberries and rosemary instead of sprinkling it on top of the dough. Verdict? A simple but oh-so-delicious recipe, folks! If you haven’t tried the rosemary and cranberry combination, if and you’re not allergic to rosemary, this focaccia has the ooomph and punch of a breakfast or afternoon snack! A refreshing departure from your cheese and tomato sauce pizza! Wednesday, December 9: news flash – Montreal receives 28 centimeters of snow! After a long mild spell, the cold has finally settled in…with a vengeance. Later that day, the traffic was bumper-to-bumper. I looked out the window and thanked my lucky stars that I no longer have to commute to work. Freelancing has its rewards and being able to work from home is a blessing. My street was pristine and all-white. At 5:00 pm, it didn’t look like the snow was going to stop any time soon. Drivers were on their cell phones and I wondered if they were asking their significant other if there was any hot soup at home. Many years ago, I used to work in Old Montreal where parking cost $10.00 a day forcing me to take public transportation. I remember waiting in bus stops, my fingers and toes frozen. I’d come home weary, teary and hungry. Back in those days, I would have given anything to have something like this waiting for me at home. That’s Betty Crocker’s southwest cheese soup on the left and on the right, George Greenstein’s milk bread which I worked into a “dunno what you call it” shape. I was feeling inspired in spite of the frenetic snow outside and my fingers were itching to create – now that they no longer get frozen. Betty Crocker’s soup has all the yummy goodness you’d expect from a southern kitchen in America. It has black beans, tomatoes, corn, cheese and milk. It’s easy and quick – the kind of soup that you can whip up for someone who’s coming home after a long commute home. You can have this soup with your favorite crackers, but I think it would go better with George Greenstein’s milk bread. You can get the Betty Crocker recipe here: http://www.bettycrocker.com/recipes.aspx/southwest-cheese-soup/44825ada-da64-469c-9b32-c2c2f309a3a5?WT.dcsvid=NDM4MTM3ODMwMAS2&rvrin=10AAA17B-6A3D-455F-BF3E-F0D863C7D1A6&WT.mc_id=Newsletter_DME_10_25_2009. George Greenstein’s milk bread is on page 37 of his book Secrets of a Jewish Baker. He uses the sponge method and the usual loaf pan for this. But like I said, I felt like experimenting so I did not use a loaf pan and opted for a free standing loaf. I also took a section off the dough to do the patches and twists. My sister had given me some cookie cutters with serrated sides last summer and this was a good time to take them out of their box. I cut out three pieces and put them on top of the loaf, and then did two twists to line each side of the bread. Fancy schmancy, you’re saying. If you want the recipe for Greenstein’s milk bread, e-mail me at ques2008@gmail.com. You’ll find plenty of milk bread recipes on the net, but I have absolute and unwavering trust on this famous Jewish baker! Instead of the egg wash, Greenstein said to brush this bread with water and bake it with steam (meaning put a pan of water inside the oven). I chose not to do it this way. There’s something about water inside the oven that unsettles me, have no idea why. For the holidays, I’m thinking of coloring my breads to make them look more festive. Food coloring – once in awhile – does not worry me. I know some people deliberately snub food coloring for health reasons. I’m also thinking of doing other crazy shapes, and I’ll definitely share them with you and post them here…that is, if the shapes don’t collapse on me! Here’s a recipe that will feed two people for under $10.00. The bonus is if you eat it for lunch, you’ll have enough left for dinner (that is, if the one you’re eating with agrees to leave some for later). 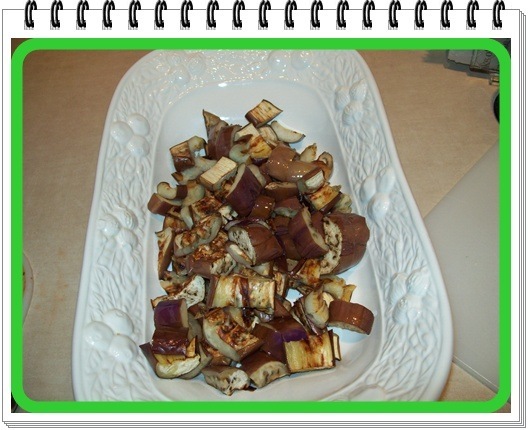 3 slender eggplants like the ones in the picture. They’re sold in Asian stores (don’t buy the fat ones that supermarkets sell). About $3.00. Set aside your eggplant. In a frying pan, heat some Canola oil (any oil will do), and then add your garlic. Sauté for a minute and then add the onions and tomatoes. Continue sautéing for about 3-4 minutes. Take 2-3 tablespoons of shrimp paste (the amount will depend on how salty you want it) and lower the heat. Using a teaspoon, take a small amount of the mixture and taste it. If it’s too bland, add more shrimp paste. Note that shrimp paste is VERY salty, so there is no need to add salt or pepper to this dish. 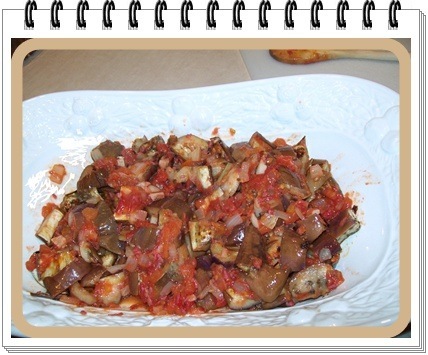 Take your onion/garlic/tomato/shrimp paste mixture and pour it over your eggplant. Mix well to make sure that all eggplant pieces are coated. Word of caution: shrimp paste will not appeal to everyone. In fact some people who have never eaten Asian fare will probably be repelled by it. It’s an acquired taste, a favorite among Filipinos and other Southeast Asians. If you don’t think you can stomach shrimp paste (it doesn’t look palatable either when you look inside the jar :)you can vary this recipe by mixing your onions, garlic and tomatoes in a few tablespoons of vinegar (or you can be creative and use your own vinaigrette or a store-bought dressing). If you’re a daredevil and think you’ll survive after consuming shrimp paste, here’s a picture of what it looks like. 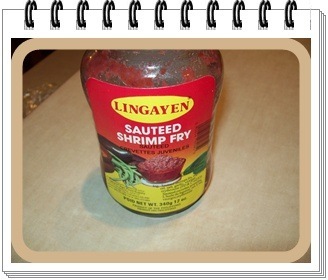 The word “Lingayen” on the label is the brand. There are other brands. Ask your Asian grocer for shrimp paste and you’ll be taken to the right aisle. It keeps well in the fridge for months, thanks to the high salt content. I know some cooks boil eggplants in water and then when they’re soft, they are peeled and mashed (almost like puréed form) and then mixed in with a nice dressing. So many ways really! 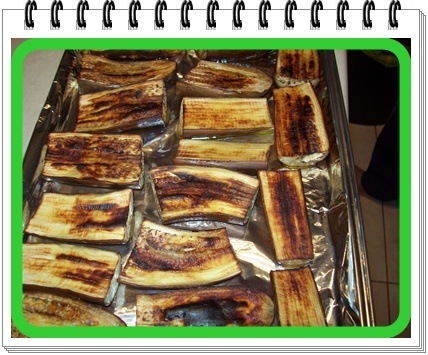 They can also be grilled and used as a garnish for pizza.